If you want to improve the sound of your signal chain while having the facility to kick the whole thing up a notch at will, the Tubecleaner will do just that. Simplicity. Ability to drive amps harder. Another PSU to clutter up the pedalboard. 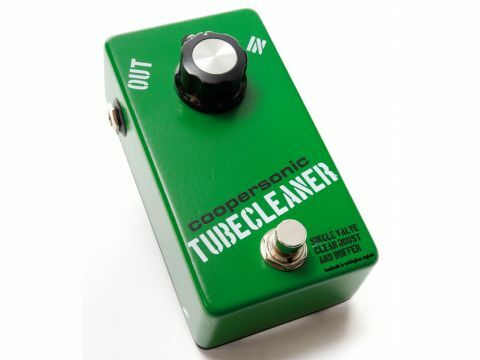 The Tubecleaner is designed for two functions - it can be used as both a booster and a buffer in your signal path. "Boosting is probably where the Tubecleaner's going to earn its keep." The buffer function, courtesy of a high impedance input and a low impedance output, is always on and can combat tone-sucking high frequency loss caused by some longer cables and pedals that don't have true bypass, by placing it in front of them. Boost, and its associated red LED, is implemented by the footswitch and there's 22dB of gain available. Featuring a single valve, the Tubecleaner comes with its own nine-volt DC 500mA power adaptor. Placed in front of an old Crybaby at the start of the signal chain it offers a definite tonal improvement, with more of the top end clearly coming through. Unity gain on the boost knob is at about 10 o'clock, so you can cut the signal as well as boost. But the boosting is probably where the Tubecleaner is going to earn its keep, as it can really push valve amps hard, resulting in loads more gain, dirt and sustain without messing with the tone. This provides a very natural route to overdrive, whether in place of an overdrive pedal or as an add-on to get more out of one.